Number Munchers | 2P START! I kind of get the feeling this comic might appeal more to The Oregon Trail crowd, but not necessarily to all of our regular readers, so apologies if you don’t get it. Of course, you’ll also need a basic knowledge of U.S. current events to get the comic, so even more apologies to everyone who is too young or too far away to know about such things. Number Munchers was another early educational PC game that a lot of us probably played in elementary school. I had totally forgotten about it until Ray brought this idea up, but luckily I was able to relive some of those childhood memories online with this emulated version. There’s also a flash remake here. In any event, we’re not trying to spark a political debate here, it’s just that $787 billion is a staggering number, even for an old pro like Muncher! Not to be picky or anything, but as a math major, I have to point out…don’t we need a function or subset of numbers or something to indicate what the muncher has to…well..munch? I don’t really see a function or set of #’s he is supposed to catch. Still, this is a very funny comic…so…vfc guys! Yes, typically he has an instruction like “Multiples of 5”, but instead we put Stimulus Package. His only goal is to get that number in his belly! Oh my goodness, I had completely forgotten about this game, but now that I see that little green creature it came back to me. NCG!! Who didnt love horrible educational games back in the day? Oh, the flashbacks I could have if my memory wasn’t riddled with more holes than there are in this goofy stimulus plan. I do recall mashing furiously on a calculator trying to beat friends at this game, waaaaay back when, but that’s about it. And who’s reflection is that supposed to be anyways? At any rate, I give this two thumbs and an empty wallet up! After playing game a little: still pending. No, I can’t say I’m really feeling it this week, guys. It’s probably a combination of things. I’m not American, for one. 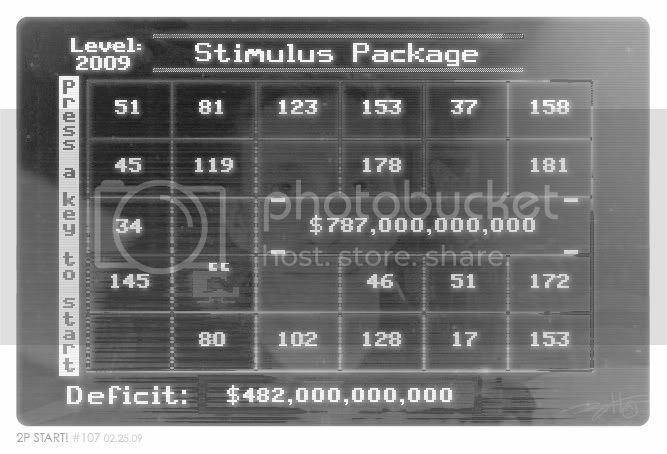 Us foreigners (well, most of us) have all heard of the stimulus package, but it’s not like it’s actually on our minds or anything. Secondly, I’ve never played the game. Not that I remember, anyway. I haven’t played The Oregon Trail either, but I liked the comic. That said, though, The Oregon Trail has a much bigger cult following on the internet than Number Munchers. Thirdly… What exactly is the joke this comic is trying to get across? 787 billion is a large number? Eh, since I’m ragging on the comic anyway, I might as well add that I don’t think the reflection was a nice touch. It was a nice idea, but in practice, it just doesn’t work. Back in the day you -could- see your own reflection in a black computer screen, except the reflection in the comic isn’t my own, so it’s just odd, and a little distracting. Okay, I think that’s the longest comment I’ve left on this site yet. Nice comic! Number Munchers was awesome! Though, I played more Super Munchers because we had it for our old iMac. At least the Stimulus Package will protect Muncher from Troggles! I like it. It’s very niche of a gag so that’ll be really hard to predict on the WWR but still. Also, why shouldn’t people make fun of this. Let’s admit one thing for a moment here… America is going to feel this sting and things in general are changing. For example, I held off my plans on joining a game studio instead of the simulation developer I currently work at 100% just because of the massive layoffs hitting my industry. I’m safe here for the time being. I’m not happy about my tax money going towards helping out rich people with failed business practices though and I sure as **** ain’t happy $75 million of that went to putting Citibanks logos all over the Mets stadium. Number munchers was really cool. I remember playing it when I was a wee lad. Thanks for bring back an old memory. Now, get out of my monitor. That reflection of Ray on the computer screen looks like he is starring into my soul . . .
That or it looks like he’s starring at me from inside my computer (like a one way window or something). Or, maybe, it could be my own reflection! Oh my gosh, I’ve turned into Ray! Ahhhhhhh! Hey, I’m hot! Sorry, don’t get it. I played Number Munchers too. Took me a second to get it. Probably cause that is a scary amount for money for me so I think I might have blanked out for a moment. Good comic though. Nice detail with adding in the reflection. I have to say you guys have outdone yourself this time. I loved number munchers when I was a kid; it taught me what a prime number was. 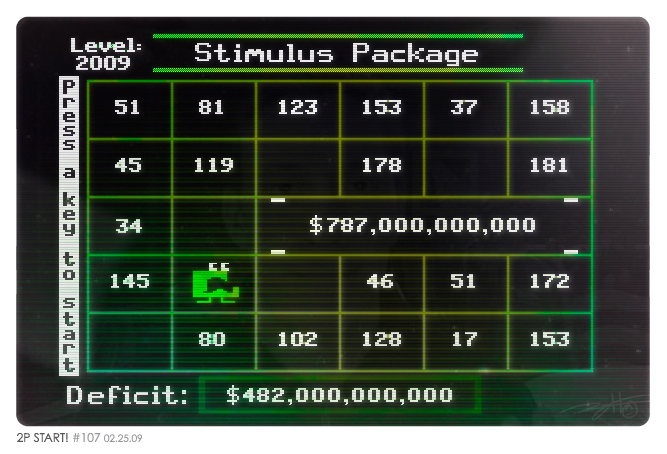 However, I don’t think I could ever handle figuring out if the stimulus package was prime or not when I was a kid. Keep the good comics rollin’! In my kindergarten, we had Super Munchers. I loved that game more than Oregon Trail. I still remember when one kid got to the level where you had to fly up the cliff. I wish I could find that one online. Congratulations! You are the all-time GREATEST player! Take your rightful place in the Muncher Hall Of Fame! …Muncher. Man I am glad I have self control. Well can’t wait for the next comic. Numbers are not my friends. This comic use to be good about three issues ago. I just don’t get it….so meh. I do like how Ray’s mouth kind of matches the Muncher though. I looked at the logo…and sighed because it was a retro comic and I probably wouldn’t get it. I was right. I vaguely remember playing the game, but not enough to get the comic. And no offense to you guys, but I really am tired of hearing about the economy. Though the reflection effect is really spiffy! The only way this could be better is if the man in the picture had little rays eyes. And was weeping. Also, what’s interesting about the reflection is that it doesn’t appear to be comic Ray, it appears to be actual Ray. That’s the first time he’s even been in a comic…but wait…does that make him comic Ray then? But if he’s comic Ray, then who’s the real Ray? And why are there now two comic Rays? Haha, thank you guys for this. I played this all the time back in elementary school, and it’s nice to see the game hasn’t been forgotten. I forgot about this game too. Wow, memories. It took me awhile to get in since I don’t remember much of the game. but it got better once I remembered it. Is it intended that his open mouth looks like a big stereotypical Mexican mustache, as to imply that illegal aliens are going to eat up the stimulus? Where’s Ray’s Blurb for this one? It seems to be missing most of the time now. IT makes me sad! ALSO I LIKE CAPS LOCK IT MAKES ME FEEL IMPORTANT. I usually hate political stuff, but because of the reference and (mostly) because of the awesome logo, I liked it. I think it’s actually more along the lines of Oil Panic than the Oregon Trail one, though. Holy crap, somebody else remembers Putt Putt? Those were awesome games–not just Putt Putt, but Pajama Sam, Freddi Fish, Spy Fox, Fatty Bear, and whatever else I’m forgetting. Same, I tried turning up my monitor’s brightness and I still couldn’t really make out much. I’ll check it out on a different computer, though, because I seem to remember my laptop having a weird issue like that before. I laughed at that too, I remember playing a variation of this game where you ate words instead of numbers, like words with a silent ‘e’ or short vowels and stuff like that. I didn’t even know that one existed. I think the Spy Fox games started coming out around when I was getting too old. I had the first two adventure games, and I also remember Hold the Mustard where you had to shoot the spaceships trying to steal the tomatoes or something…that one was fun. Ok, not sure if its a rise from the grave, since I only found the site a few weeks ago, but I did manage to go through all the comics as well as all the podcasts (yes I am a diluded fan), but I really wanted to say that this is a great site in general. 1. I forgive you for the Mario Steroids. 2. I will say that I miss the Trivia 4 2 section and regret that I have not been able to submit for it, since I found it after it was eliminated. Sorry for the double post, but I fogot to mention I think that they Ray-Tim election should be an annual event. but’s that just me. Hey guys, considering i just found you guys about a week ago, i decided to listen to ALL the podcasts and read ALL the comics (Which earned me 2 acheivements, and whoever gets that refrence gets 10 hypotheical points) before i ROSE FROM MY GRAVE. I just wanted to say that you guys are awesome. Oh and Ray, you arent as much as a sonic dork as you think you are, you’re just about at the same level as me, which isnt that high considering those who know just about the name of every track, the sound director of each game, and just about everything else. Cant wait for new podcasts and comics! I remember this game. i used to play all the time in elementary school. Welcome! I’m D3vin, the resident guest writer. Nice to see you aboard. Sorry guys, this comic didn’t really make me laugh. Also, I have to complain about the mobile version of 2pstart as well, it’s really hard to use. What I really wish is that my iPhone had an option to turn off these mobile versions of websites, because I would very much like to do that, also with sites such as DeviantArt. But really, I’m not a fan of the mobile version, and not really a fan of the comic this week. OMG are you kidding me?? I haven’t seen this game in years! Not the funniest work EVER, but I still got it and thought it was great. Plus it’s the first time I’ve ever seen this game mentioned in any of the 5 gaming webcomics I read. Keep it up guys! The best part of this comic hands down is Ray’s reflection. Let’s call it IRL Ray (in real life) as opposed to Comic Ray. I wish I could see Ray’s facial expression in the image…I bet it looks just like Muncher’s. So when is IRL Tim going to make an appearance? I like how you guys always explain what you’re referencing in the blog. Too web comics lose people and don’t bother to try and clue them in. Thanks! Number Munchers, what a great memory. But I played more of Word Munchers, in the same line. Great strip! I loved number munchers as a kid. Kudos for nostalgia flashback! Also, I have to complain about the mobile version of 2pstart as well, it’s really hard to use. Gadoink, care to elaborate? What about the site is hard to use? That number is tough for anybody to swallow—supporters, detractors, and munchers alike. Awesome comic guys, this brings me back to the great days of my young childhood, playing all the fun Humongous branded games, like Putt-Putt, Pajama Sam, Freddi Fish & Luther, and my favorite, the Spy Fox games. Surprisingly, I have actually seen a few collections of these games in the pc game bargain bins that you see at places like office max. But the first educational game i really remember is Number Munchers. And my love of this game since I was a toddler made this a both nostalgic and hilarious comic. Thanks guys! Navigating the site was kind of difficult for me, and also, you can’t directly reply to comments. I’ve never actually played Spy Fox, just for the record. Have played Putt Putt, Freddi Fish, and I think a demo of a Pajama Sam game. Yeah, really. I didn’t think those games were THAT popular. They were awesome, though. The funny thing is, Number Munchers was brought up in the Oregon Trail comments, and now it ended up being made into a comic. Confirmed: The next random childhood-flashback-game comic is going to be about a Humongous game. I know its a small point, but I just noticed the level. Ray must be really good to get all that way. On a side note, I really have to avoid double posting in the future. it takes up too much space. I loved Putt putt goes to the moon for the little game you played in the cafe on the moon. that minigame as the best part of the entire game. I also played reading rainbow, cluefinders, and Another math one whose name i forget. Sadly i never played number crunchers and therefore don’t get this comic. oh well. yeah, Putt Putt goes to the Moon was the one I had. That brings back memories. I guess it’s a shame I never played that one. I don’t really remember anything except for the underwater school, the conch, the zoo, dry cereal and some assembly required…Oh, but I do remember the first three Pajama Sam’s. Pajama Sam was my second favorite after Spy Fox. I Can actually see the reflection now that i am on a different computer. Genius! Hmmm… I could kind of see that there was something there, but not what. A few seconds of messing with the levels in the Gimp and I’d pretty much extracted the hidden image. I saw the face in the podcast. The funny part is that Muncher is looking straight at Ray! God it’s like you shoved me back into grade school…but made it funny. I especially like where you try to ford the river in your truck. Good times. Don’t not archive the pod casts. I am listening to them now for the first time. There awesome! I will be commenting on them as I go I think. Can’t wait to see if you got my name right in your rise from the grave in you’re next podcast. This was supposed to be be on the Podcast that references this comic, my error. Heh Oregon Trail. Little known trick: if you shoot a bear in the behind, it dies!